I've celebrated last New Year's Eve dining with some friends and, even if for once we haven't go to dance, we went to bed indecently late thanks to a wonderful company, delicious dinner, great conversation and Wii Sports and Wii Big Brain Academy. Definitely the start of 2009 is something to remember. While my man took charge on cooking the main courses (I'll write in detail about some of his recipes, for instance Fisherman style clams or his already famous Stuffed eggs... not a figure of speech, you now ;P... ) I focused on desserts: Two-chocolates caramel on biscuit (only for chocoholics, see photo, recipe coming soon to your screens!) 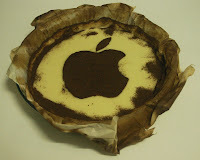 and the Mac fan's white chocolate tart. Why mac fan? 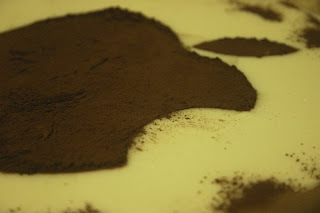 In Pepinho's original recipe (in spanish), the tart should have been covered completely in cocoa powder. Well, once baked there was I, as always, thinking on how giving it a special touch. I needed a motif to cut a sheet of parchment paper and sprinkle the cocoa as quickly as possible in order the sheet doesn't get glued to the tart. First I though in a Christmas motif, but none of them seems to fit: they were too complicated to cut out or too boring. Suddenly, I looked at my marvelous 17'' MacBook Pro with its beautiful shinning apple and I knew the answer. It was that simple, all diners were mac users. I laughed as only a true mad scientist can and went for it. For being the first time I make a decoration like that it came out nicely (however, next time I'll use the inverse cut out of the motif, it's easier to use). The tart made everybody laugh and its flavor was really nice, I must recognize it, even if I prefer dark chocolate this one really took me in. And remember, if you like less sweet flavors reducing the amount of chocolate 50 gr. will do the trick. Put the sheet of pastry on a mould (22-24 cm diameter) covered with parchment paper. Cover it with another sheet of parchment paper and put over it beans until covering the bottom. Then bake at 180 ºC until the borders get golden. Then left to cool. Meanwhile, put the cream in a small saucepan to warm and add the chocolate slowly, stirring continuously. When it is well mixed add the gelatin powder and continue stirring a couple of minutes. Remember not letting it boil. Now left to cool. When it's just warm pour it over the pastry tart and put it to cool in the fridge for, at least, 4 hours. Decorate with the cocoa powder. Pepinho adds some cardamom seed (powdered). I also recommend a couple of spoons of vanilla syrup or similar (I used Vahiné's). To decorate you can also use grated chocolate. When serving have a try to chocolate creams, syrups and whipped cream. Try it with other chocolate types: milk, dark or bittersweet. You pulled that tart off really well! Very fun. I know what you mean about Wii Sports - I spend way too much time and get way too little sleep because of that darn Wii Sports tennis. I'm enjoying myself greatly reading you, specially the articles about baking (a subject pendant in my kitchen). Hope to learn many things from you!